With the goal of harnessing the untapped potential of Iranian-Americans, and to build the capacity of the Iranian diaspora in effecting positive change in the U.S. and around the world, the Iranian Americans’ Contributions Project (IACP) has launched a series of interviews that explore the personal and professional backgrounds of prominent Iranian-Americans who have made seminal contributions to their fields of endeavour. We examine lives and journeys that have led to significant achievements in the worlds of science, technology, finance, medicine, law, the arts and numerous other endeavors. Our latest interviewee is Mehrzad Boroujerdi. 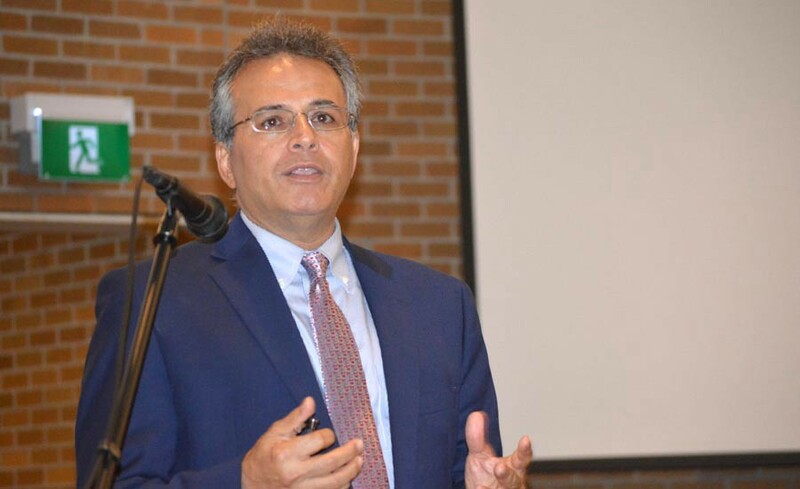 Mehrzad Boroujerdi has been a professor of political science at Syracuse University’s Maxwell School of Citizenship and Public Affairs since 1992. He received the Maxwell School’s Daniel Patrick Moynihan Award for best teaching, research, and service by a junior faculty (1998), was named the school’s inaugural O’Hanley Faculty Scholar (2014 to the present), and was recently awarded the Astrid Merget Fellowship for graduate teaching in the area of foreign policy. Dr. Boroujerdi has held a variety of administrative posts at Syracuse University including: founding director of the Middle Eastern Studies Program (2003–14), founding co-director of the Religion, Media and International Affairs initiative (2006–09), chair of the Political Science Department (2014–17), Provost Fellow for Internationalization (2015–17), co-chair of the Internationalization Council (2016–17), co-chair of the Academic Strategic Plan Working Group on Enhancing Internationalization (2014–6). He received the prestigious American Council on Education (ACE) fellowship and has been the recipient of $1.5 million in grants from such institutions as the Carnegie Corporation, Institute of International Education, Henry R. Luce Foundation, Princeton University, Social Science Research Council, United States Department of Education, United States Institute of Peace, and the Violet Jabara Charitable Trust. He has been a visiting scholar at UCLA’s Center for Near Eastern Studies (2017–18), President of the Association for Iranian Studies (2012–14), co-founder of the Iran Data Portal (2011-present), a non-resident scholar at the Middle East Institute in Washington, D.C. (2005–16), and the book review editor of the International Journal of Middle East Studies (2000–07). In 2011, he received the scholar Rescue Fund’s Outstanding Service Award from the Institute of International Education. Dr. Boroujerdi is the author of Iranian Intellectuals and the West: The Tormented Triumph of Nativism (Syracuse University Press, 1996), and I Carved, Worshiped and Shattered: Essays on Iranian Politics and Identity [in Persian] (2010): editor of Mirror for the Muslim Prince: Islam and Theory of Statecraft (Syracuse University Press, 2013); and co-author of Postrevolutionary Iran: A Political Handbook (Syracuse University Press, 2018). Mehrzad Boroujerdi received his Ph.D. in International Relations from The American University in 1990. I was born in the oil-rich province of Khuzestan in 1962 and moved frequently from one city to another due to the nature of my father’s position at the National Iranian Oil Company. After finishing the tenth grade, I came to Boston, Massachusetts in August 1978 to go to high school and eventually become a petroleum engineer. A few days after I arrived in Boston martial law was instituted in Iran as the revolution began to gain momentum. Having been exposed to the extreme class differences in Khuzestan, I was drawn toward politics and mesmerized by the fact that the revolution was inscribing politics in the register of the divine. I was eager to make sense of all these so I went to Boston University and studied political science and sociology. Therefore, I guess you can say that the revolution cured me of the desire to be an engineer. I found the social sciences much more captivating and resourceful in making sense of the tumultuous events (the revolution, hostage crisis, Iran-Iraq War, reign of terror) unfolding in Iran. Alongside my “political activities,” I continued my academic studies and earned an MA in Political Science from Northeastern University, and then a Ph.D. in International Relations from The American University (Washington, DC). I then did two years of postdoctoral work at Harvard University and the University of Texas at Austin, and since 1992 have been a professor of political science at Syracuse University in Upstate New York. Till the roughest patches will be past and gone. That you have left so many miles behind. And very soon the tedious climb will stop. And you will stand triumphant at the top. Can you share some highlights of your work in your areas of expertise? Could you please shed further light on your research that has made contributions to your fields of interest? I will just highlight the contributions of two of my books. My first book, Iranian Intellectuals and the West, aimed to provide an account of the intellectual history of post-World War II Iran by introducing the concept of “nativism.” The book argued that such discourses as “Westoxification” and “return to Self,” popularized by such figures as Jalal Al-e Ahmad and Ali Shariati, should be analyzed through the lens of a nativistic yearning that had emerged in that conjuncture as the most popular ideological battle cry. My latest book, Postrevolutionary Iran: A Political Handbook, abandons intellectual history in favor of empirical research on political elites. This book is the product of fourteen years of painstaking research that allowed me to write biographical sketches of 2,300 politicians and assemble a treasure trove of factual information on elections, political parties, family ties, etc. I believe this book is indispensable for anyone who wishes to understand and analyze the first four decades of the Islamic Republic of Iran. There is no book like it for any country in the Middle East or North Africa. So I think I have made contributions to study of Iranian politics both theoretically and empirically. Some of the biggest challenges I have faced in my career are: (a) how to educate the Western public to abandon some of their cherished stereotypes about Iran in particular and the Middle East in general; and (b) how to look at things through the analytical detached eyes of a social scientist while all around me people have strong partisan beliefs which they want you to embrace. In your view, what is the biggest challenge with which your field is currently grappling? My field of political science is currently undergoing a phase where quantitative analysis is becoming increasingly powerful and those who do more qualitative work feel increasingly marginalized. I believe to do good political science type analysis we need the insights of both approaches and keeping that eclecticism is essential to the future of the discipline. Can you tell us about your research which earned you the most awards and recognition? I think my first book is what helped to put my research on the map. The book was very well received in academic circles both in the West and in Iran where it became part of the essential readings on modern Iranian political history in many universities. It was also translated into Arabic and Turkish which was very pleasing. What are the research avenues you are exploring for the next few years? I want to write a biographical manuscript that deals with how my family’s life has been altered by the vicissitudes of modern Iranian history. At this point I can’t tell you more than this. I am perfectly content with my Iranian-American identity. I love both countries and owe each one a big debt of gratitude in making me who I am today. I can no longer go back to Iran on account of my writings but it remains a big part of whom I am. When I go to bed at night it is Persian poetry which calms me down, and when I want to write analytically, English is my preferred language. I have lived in America for exactly forty years and love the freedom and opportunities that this great country has accorded me. Being a hyphenated American and playing the role of a cultural go-between has enabled me to also see things through the vantage point of a different culture which I think is fantastic.